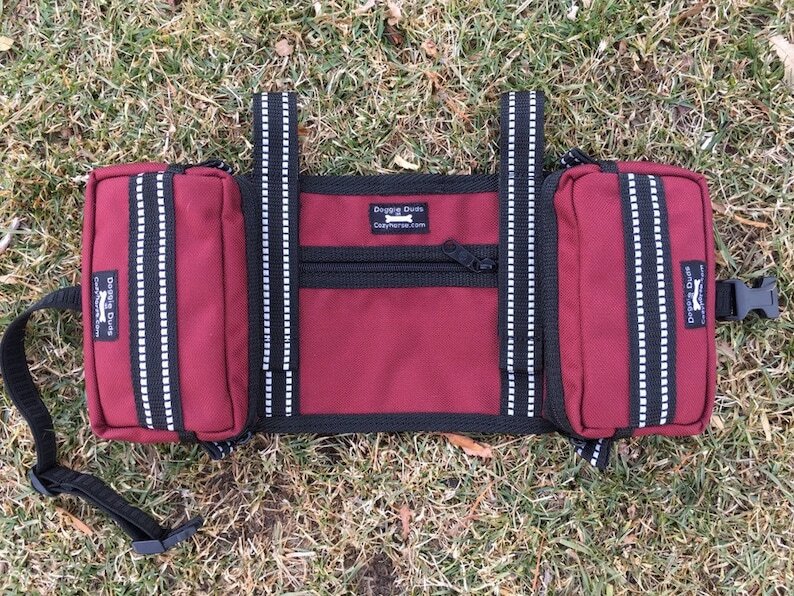 This listing is for saddlebags that can attach to a dog harness. Will attach to several different style harnesses. A harness is not included, packs only. Great for Service Dogs as these packs can attach to almost any style of harness. The straps for attaching are long and can wrap around a harness up to 2" wide. The straps fasten back onto the saddlebags and hold them in place. These are also great for dogs out on hikes for taking along a few supplies. Pack measures 6" front to back x 13" side to side. Side pockets 3" deep by 6" wide x 2" deep. Has a comfortable elastic girth strap that adjusts from 22" -27" before stretching. Shown on a 30 lbs dog with a plain nylon harness and also a conversion strap. Once again, a harness or conversion strap is not included.